That’s surprising news from an actor who joked with The A.V. Club about turning his back on modern technology, and even more notable considering the character he plays in Green’s series represents the world before gadgets and smiley-face icons. American Gods casts McShane as Mr. Wednesday, a.k.a. All-Father, a.k.a. the Norse deity Odin. He’s the leader of a group of old gods now moored in the U.S. and prepping for war against the new ones, whose ranks include physical manifestations of present-day obsessions like, yes, technology. The old gods are representative of the legends people brought with them when they came to America; the new ones are what we’ve become consumed by. When the novel by Neil Gaiman came out in 2001, emoji weren’t part of the cultural dialogue. Now the already acclaimed adaptation is set to debut in a much different landscape, one in which an eggplant can be used to convey something dirty and stories about immigration are inherently political. But when or how it was going to be adapted wasn’t always a given. 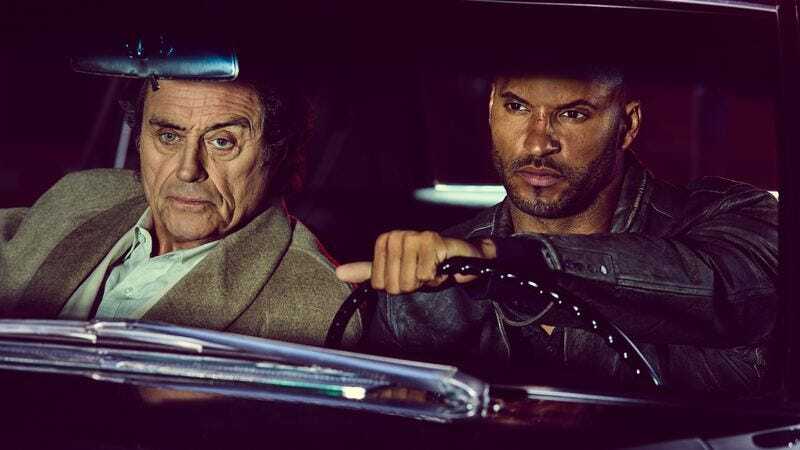 American Gods isn’t an easily contained or explained narrative. It’s a sprawling, complicated epic that centers on Shadow (Ricky Whittle), who, just out of prison, is hired (or, perhaps more accurately, is coerced) into working for Wednesday after discovering that Shadow’s wife, Laura (Emily Browning), has died in a car crash while having an affair with his best friend, Robbie (Dane Cook). Along the way the new gods like Media (Gillian Anderson) try to woo Shadow to join their side or threaten him. And all the while Gaiman weaves historical tales of how these deities wound up in the country. Remove the fantasy elements, and the show’s about how this nation was built on the many faiths of countless people who traveled from far away to get here. In 2011, however, he joined forces with Tom Hanks’ production company, Playtone, to develop an American Gods series for HBO. News that the project was underway broke just before HBO launched a different fantasy property: Game Of Thrones. “By the time we’d handed our script in, our nice, smart exec had gone, and the people remaining were going, ‘We don’t really know what it is, and we don’t really understand it, and we don’t like it that much,’” Gaiman said. “So we did two drafts and a polish, and they gave us the rights back.” The author explains he was “relieved” when HBO got out of the picture, which ultimately led him to Starz and Bryan Fuller, the creator of visually marvelous worlds ranging from the whimsical (Pushing Daisies) to the nightmarish (Hannibal). What sold Gaiman on Fuller was not that he had a vision for tackling the challenging material immediately in mind, but that he loved the book. Fuller remembers Gaiman coming to visit him in Toronto; when he was asked if he wanted to do it, he said yes—with Michael Green, creator of the biblical-themed and short-lived NBC series Kings, which starred McShane. These days, Green is racking up blockbuster credits like the acclaimed Wolverine movie Logan, the Blade Runner sequel, and the new Murder On The Orient Express. But perhaps the most notable change to the story involves fleshing out Laura’s backstory and her own plot. (Per Schreiber, Laura and Mad Sweeney eventually get their own road trip. It was pitched to him as: “Bonnie And Clyde with a zombie and leprechaun.”) The fourth hour establishes her complicated persona, and Fuller considers it “perfect hybridization” of his and Green’s styles. For Green, it’s indicative of how their ideas can mesh seamlessly with the source material. “It’s fan fiction that works its way into the new author’s preferred text,” he says. And the show may yet have some impact on what Gaiman produces in the future. “Were I ever to write Wednesday again, he would probably sound a lot more in my head like Ian McShane, because listening to Ian deliver those lines is like, ‘Oh, that is the best they could ever be delivered,’” he says. But will he share McShane’s penchant for emoji?